Now that Asumi has been accepted into space school, her work can begin in earnest. Her first days included both signing up for an obscene number of credit hours as well as getting settled in her humble but adequate room. Because to rooms in the apartment are so cheap, there aren't too many girls living there, but the one she meets seems very nice and wants to help Asumi out. Asumi also finds some familiar faces, including Kei, Marika, and Fuchuya. Asumi has been planning to go to space for as long as she can remember. Running, studying and working hard have been a part of her life since she was young. So for her the workload, both physical and mental, is much less of a shock than it is for others. She will have some of her own special difficulties, though. Because of a near drowning incident when she was small, she has a difficult time with the swimming requirements. Her height is also an issue, as everything needs to be cut down or custom-made for her. This gets expensive though, and when bureaucrats are the ones managing the budget, that can cause some problems. Again, we also get two stories from Asumi's past. When she was in the first grade, and her father was still trying to make reparations for the rocket disaster, she meets a little girl. She doesn't go to school, because her arm is bandaged and she gets teased by the other children for it. Asumi befriends her, though, but after a fight she fears that she'll lose her friend forever. Will Mr. Lion be able to help her save the friendship? We also see a bit more of Miss Suzunari, Asumi's teacher. Suzunari's father worries about his daughter. He thinks she still hasn't gotten over losing her near-fiance, and wants her to come back to Tokyo to help run the family business. In the meantime, Asumi wanders off on a school scavenger hunt and Suzunari and Fuchuya have to find her. Will Suzunari move on to Tokyo, or stay at the school? Twin Spica is certainly in the tip five recent manga on the market. 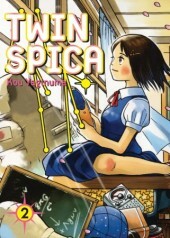 Between the fantastic portrayal of Asumi and the relationship she has with those around her, and the often heartbreaking flashback stories, Twin Spica is a modern classic the likes of which only come along once in a blue moon. Highs: Asumi really has always gone out of her way to be friends with everyone. Lows: I really dislike poor-little-rich-girl type characters that it seems like xxxxx is turning into. Verdict: Still one of the best seinen books today, and there's plenty more to go.